Muktar Edris defeated Mo Farah in the 5,000-meter race, Farah’s last track event before focusing on the marathon. As much as the 2017 IAAF World Championships of track and field were about bidding farewell to a pair of legends, it was also about introducing some fresh faces that are vying to make their mark as superstars in the sport. This year’s biggest track meet was advertised as the last hurrah for Mo Farah, arguably the greatest distance runner of all-time, and for Usain Bolt, undeniably the greatest sprinter of all-time. Farah, a Muslim who represents Great Britain, had gone undefeated in four straight major-championship meets dating back to 2012 in the 5,000 and 10,000-meter races. Bolt, from Jamaica, had gone undefeated in six of his last seven major-championship meets dating back to 2008 in the 100-meter dash, 200-meter dash and 4×100-meter relay. But athletic perfection cannot last forever, and in London last week, both Farah and Bolt fell short of the gold-medal sweeps that many expected in their respective finales. Farah captured gold in the 10,000 meters, but finished second in the 5,000. Bolt, who skipped the 200, finished third in the 100 and didn’t finish the 4×100 relay final, pulling up with a leg injury. However, I doubt either athlete is retired for good just yet. Farah has already said that while he’s run his last race on the track, he will continue running marathons. Bolt hasn’t been clear on exactly when he’s retiring. With the way things ended for him in London, I believe Bolt is going to look to end his career on a better note at a later date. By the end of the men’s high jump competition, the question was not whether or not Barshim would win; it was whether or not the 6-foot-3, 150-pound human spring would break the world record. While Barshim didn’t get a chance to match Cuban legend Javier Sotomayor’s record of 2.45 meters (8 feet), his high mark of 2.35 meters (7 feet, 8.5 inches) was enough to earn his first major-championship gold medal. After cruising through the qualification round and the final without missing a single attempt, Barshim already had the gold medal clinched when he took three unsuccessful cracks at 2.40 meters. But the most impressive thing Barshim accomplished in London may have been during warm-ups, when he effortlessly hurdled the high-jump bar while it was about six and a half feet off the ground. Farah opened these world championships with a bang, winning the 10,000 meters in a dramatic and physical race on the first night of competition. Farah’s competitors over the years have tried numerous strategies to curtail his dominance; the most popular being to push and bump him off his rhythm. In the 10,000 meters, Farah almost got bumped clear off the track but managed to win his sixth world championship gold medal, to go with four Olympic golds. In the 5,000-meter race, however, Farah finally fell at the hands of Edris, the 23-year-old who simply out-sprinted Farah to the finish line. And did Edris mock Farah’s famous victory celebration afterward? Farah is known for his “Mo-Bot” — making the letter “M” with his arms over his head — and then dropping to the track in prostration to thank Allah (subhanahu wa ta’ala) after each win. 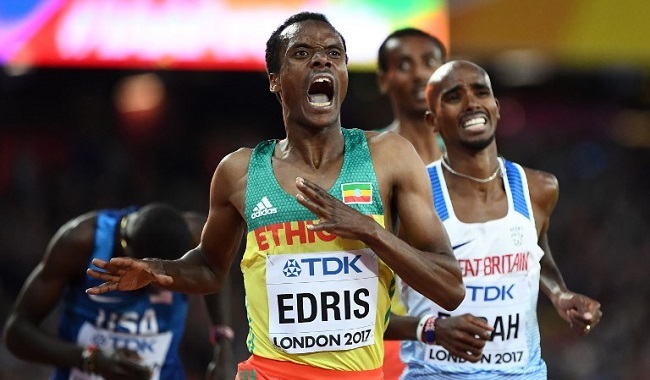 After Edris beat Farah, he did his own “Mo-Bot” — or perhaps it was the “Muktar-Bot”? — then knelt in prostration. I don’t know about the first part, but the second part was no mocking gesture. Edris always shows his gratitude to Allah (swt) when he wins a race. The Muslim from Ethiopia is one of the rising stars in the distance-running world, ranking No. 1 in the IAAF Diamond League 5,000-meter standings this year. With Bolt opting out of defending his 200-meter title, the favorite in London was South Africa’s Wayde Van Niekerk, the current world-record holder at 400 meters. The 200-meter final also included Botswana’s Isaac Makwala, who has been surrounded by controversy due to a long story involving a medical quarantine and his running a solo qualifying heat. Then there was Japan’s 18-year-old sensation Abdul Hakim Sani Brown, and Isiah Young of the U.S., who had the fastest time in the semifinal round. One could argue that Guliyev was the least talked-about man in the field. And yet he ended up pulling off an upset that was described as “stunning” in headlines around the world, beating silver medalist Van Niekerk with a time of 20.09 seconds. It was the highlight of a year that has seen Guliyev win gold at the European Team Championships and at the Islamic Solidarity Games. A versatile distance runner who excels on soil (gold at the 2015 cross country world championships), on the track (bronze at the 2016 Olympics in the 10,000 meters), and on the road (winner of the 2017 Dubai Marathon), Tola covered the 26.2-mile marathon distance in London in 2 hours, 9 minutes and 48 seconds; about a minute and a half behind gold medalist Geoffrey Kirui of Kenya. The reigning Olympic gold medalist won the 400-meter hurdles at this year’s USA Championships with a meet record of 52.64 seconds, which is still the fastest time in the world in 2017 and just 0.30 seconds shy of the world record. Muhammad also had the fastest time in the qualifying rounds in London. But in the final, Muhammad was beaten by U.S. teammate Kori Carter, who had finished third in the national title meet. Muhammad ran a fine race, leading all the way up until about the eighth of 10 hurdles. Carter pulled even on the ninth hurdle and just had a bit more over the last few steps to edge Muhammad. As the competitors in the women’s 400-meter final neared the finish line, Naser looked like she was going to just barely miss out on a podium spot. The 19-year-old was in fourth place before reigning Olympic champion Shaunae Miller-Uibo of the Bahamas, who was leading the race at the time, pulled up with an apparent leg injury. Phyllis Francis of the U.S. surged to the lead, while Naser beat U.S. superstar Allyson Felix to the line to claim silver. 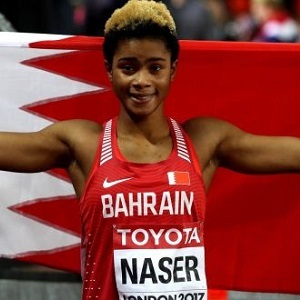 You might have recognized Naser during her time on the junior circuit, when he often ran while wearing a hijab headscarf and a modest track suit that covered her arms and legs with the bright red colors of Bahrain. More recently, though, Naser has been running in more traditional track gear. Standing 6-foot-2, El Bakkali is tall for a distance runner and usually towers over his competition. But up until now, he hadn’t stood out in terms of earning medals at major-championship meets. The main storyline going into the men’s steeplechase in London focused on Kenya’s Ezekiel Kemboi, as the 35-year-old tried to win his fifth straight world championship gold medal. El Bakkali ran two seconds slower than Kemboi in the semifinal round, but in the final he — and 10 other runners — passed Kemboi as the aging star just ran out of gas. El Bakkali’s time of 8 minutes and 14.49 seconds was less than one second shy of his personal best. More importantly, he earned his first-ever medal on the big stage. One of the most endearing and emotional moments of this year’s world championships was Ghazal’s elated reaction to winning bronze in the men’s high jump. At 30 years old, Ghazal has, like anyone who is from Syria or of Syrian descent, suffered great pain and loss in recent years due to the tragedies and atrocities of war happening in the Muslim-majority country. And on his way to reaching the highest levels of his sport, Ghazal has said that he’s had problems even attending some track meets because certain countries see his passport and profile him. The bronze medal was Ghazal’s first at a major-championship meet — he has won gold at the Islamic Solidarity Games and the Military World Games — and he earned it with a clearance of 2.29 meters (7 feet, 6 inches). Hassan is one of the best 1,500-meter runners in the world — winning bronze in the event at the 2015 world championships, gold at the 2016 world indoor championships, gold at the 2014 European championships and gold at the 2015 European indoor championships. But this year she decided to focus on the longer and obviously more grueling 5,000 meters … and she’s again one of the best in the world at it. The 24-year-old nearly caught Ethiopia’s Almaz Ayana, the 2016 IAAF Female Athlete of the Year, for the silver medal in London. Born and raised in Sudan, Haroun changed his name after gaining citizenship in Qatar and representing the Muslim-majority country in competition. Since then, he has also been a rising star in the sport. Haroun owns the Asian indoor 400-meter record, and owns gold medals from the Arab and Asian championships. He failed to make the 400-meter final at last year’s Olympics, but this year he not only made the final, he made it onto the podium. In the final event of the world championships, the London crowd was able to celebrate the home team taking the bronze in the men’s 4×400 relay behind winners Trinidad & Tobago and second-place U.S. That moment was thanks in part to Yousif, who also helped Great Britain win bronze at the 2015 world championships. Yousif, who has become something of a relay specialist, had qualified for the 2016 Olympics, but an injury prevented him from competing. He was able to make up for it this year and claim another major-championship medal.